Ball check NRV (non return valve) are available in various sizes from 15 mm (1/2") to 200 mm (8"). Option for body material in either CI, WCB or SS 150#. Flanges are drilled as per ANSI B 16.5 or as per customer specifications. All Polycoat valve are coated with high quality, corrosion resistant polyurethane paint. 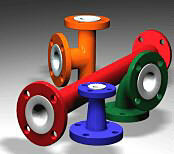 Standard 'Y' strainer are supplied in Stell body.